If we faulted the Central Bank of Nigeria, CBN, for reintroducing the N65 charge for ‘remote on us’ ATM withdrawals, then should we castigate and even chide the National Youth Service Corps, NYSC, Management for requesting prospective corps members to pay the sum of N4,000 in the name of printing out their soon-to-be online mobilization letter. This is not to make light the evil inherent in what CBN has asked commercial banks to do to us. You can agree with me that a world of difference exists between N65 and N4,000, not minding that one is paid after every forth withdrawal while the other is paid once in a prospective corps member’s service year. Willy nilly, both rank as unpalatable and exploitative policies of government agencies which do not in any way deepen the public good. It is difficult coming to terms with what informed the new proposition by the NYSC Management. Indeed, not even reason nor rhyme can explain this yoke that the Scheme is about laying on hapless and already-deprived Nigerian youths. I have tried to ask myself this: How can you tell someone who is coming to be of service to you to pay before doing that? Is it not said in some quarters that to serve Nigeria is not by cost? Under which law is NYSC basing its new direction for the sum of N4,000 to be paid before a prospective corps member can print his or her call-up letter? This unfounded demand for the payment of N4,000 before the printing of one’s call-up letter for national service has actually betrayed the willful ignorance or misconception that those managing the NYSC have regarding the scheme they are supposed to be administering. They have inadvertently led us to understand that they see themselves as doing our youths a favour by mobilizing them for service. Hence, the N4,000 ‘compensation’ they are demanding. They would rather not call it compensation fee, but deep inside of them, that is actually what the money is mearnt. They are just deceiving us by describing it a portal fee. I had thought they knew better. Telling us that the money is a reward for all their troubles in calling up our graduating students for national service would have been more plausible than this ‘super story’ of the money being cost of printing out the online call-up letter. On a more serious note, I wouldn’t have expected even the least informed or lowliest NYSC official to carry about in a manner that suggests that the Scheme is doing a favour to those being called up. You can then imagine how crestfallen I was learning that this exploitative and unreasonable decision came from the Management of the Scheme. According to an advertorial signed by the NYSC Management which was published in some national dailies, all graduates from Nigerian Universities, Polytechnics/Monotechnics and those affiliated to them are to carry out their biometric-enabled online registration using their Matriculation Numbers and JAMB Registration Numbers. Good innovation! Did you notice the decoy they used in attracting patronage to the option that would generate N4,000 for the Scheme from every prospective corps member. They submitted that it would facilitate accelerated processing for their customers when they get to the orientation camp. Given the difficulty associated with getting processed into the orientation facilities of the Scheme, who wouldn’t want to get his or her call-up details online? Of course, everybody would, but not everybody can. Irrespective of the fact that not everybody can, NYSC seem not to give a damn about those who can’t.
? Under which law is NYSC basing its new direction for the sum of N4,000 to be paid before a prospective corps member can print his or her call-up letter? 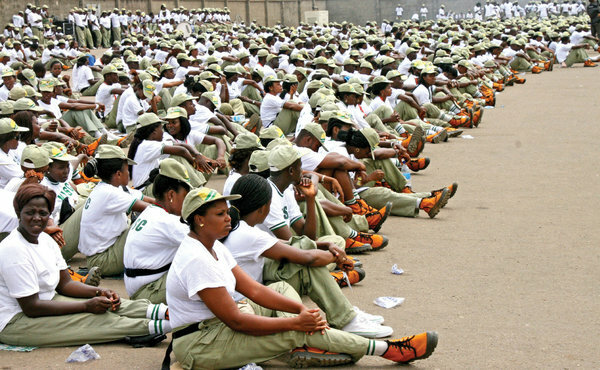 In the said advertorial, the Management of the scheme noted with an air of finality and authority: “members of the public should know that with effect from 2015 Batch “A,” all prospective corps members have to print their call-up letters online.” Whither the fate of the poor in this country? This explains why everybody is trying to escape poverty either by hook or crook in our nation. If we keep mute about this now, I wouldn’t be surprised if NYSC comes out tomorrow to decree that discharge certificates will henceforth be printed from the net at the rate of N10,000. It is also possible that without being opposed now, they will by next year, when the collection of call-up letters would solely be through printing from online, the portal charge will by then spike to N5,000. Considering the large number of graduating students that get mobilized by NYSC, one cannot but imagine the stupendous amount to be raked in by the Scheme courtesy of the new policy. It beggers answer what a parastatal where government funds all its expenses including what is spent on stationeries would want to do with the staggering returns that this N4,000 fee would ultimately amount to. Is it that our government have become so broke that it is surreptitiously trying to morph an erstwhile noble NYSC into a revenue-generating agency? We verily need to ask the NYSC Management if it took a good assessment of those on who it is placing this charge. These are people majority of whom struggled to make it through our capitalist tertiary institutions. Some of them had their parents selling virtually all their prized possessions to see them through school! Then again, they are the people who constitute the most ICT-compliant age-bracket in our country. They must have already detected the scam in this NYSC’s new policy. I bet the Scheme would have smoothly got away with playing this fast one on those of the older generation, but they cannot so easily succeed in deceiving our today ICT-conscious youths. Pray, how can NYSC justify its new pronouncement to someone whose blackberry or andriod internet service subscription for one month doesn’t gulp as much as half of the N4000 the scheme is requesting them to pay to be able print a slip of paper? Like someone rightly asked: are they printing out an entire e-book? Let us once again ask the NYSC if it really considered the particular class of people it is trying to take advantage of? These are incidiary persons who are at the edge of expressing their frustrations with a ruling-class that has failed them in many ways. They are the same bunch whose elder siblings, and possibly some of them, recently endured what may pass for their most traumatic experience because they wanted to be staffers of the Nigerian Immigration Service! Indeed, some of them must have lost dear ones from that ordeal. Somebody had better re-echoed that song where Fela sang: ‘wahala you dey find, wahala…’ to the NYSC Management while we pray it doesn’t get ‘the wahala’ it is seeking. One major problem our country has with those within its corridors of influence is that they quickly lose touch with reality. They are so sequestered in their comfort zones that they become utterly ignorant of how penury ravages a vast majority of people in this country. Those in charge of NYSC may have asked in their cosy offices: ‘is it not just N4,000?’ Yet they don’t know, like RayPower’s Ehiedu Aniagwu asserted on Political Platform that there exist families in the rural areas that don’t spend up to that amount on their monthly feeding. Considering that a section of the Nigerian public have continually clamoured for the scrapping of the NYSC, one would have expected the Scheme to be more circumspect in the manner it conducts itself so as not to play into the hands of those who believe it has outlived its usefulness. This is all the more reason we need to ask where the Act establishing the Scheme endorsed the payment of a specified amount before prospective corps members can access or print out their call-up letters. NYSC is there to help Nigerian youths better understand other ethnic groups in their fatherland; to interact with people of other tribes within the one year of national service. By so doing, they get to understand the cultures and traditions of the various peoples of the country while those peoples also get to see the cultures and traditions that reign supreme in the corps members’ homestead using them as windows. This is ultimately with a view to reducing acrimony and disaffection while engendering harmony and understanding among the various sections of the country. With this as the case, it then becomes inconceivable for the agent responsible for building this understanding, harmony and peaceful co-existence in our highly-ethnocentric and tribalistic country to be required to part with N4,000 before he or she can play this much needed role for our society. The NYSC management must really be made to understand that they are not doing our graduating students any favour by mobilizing them for national service.